For Bay Area residents, this brochure says it all: “If you could live anywhere else… you wouldn’t.” That’s why many subscribed to San Francisco magazine—for news, stories, and updates about the culture, the arts, the food and… so much more. Only in the Bay Area. Sometimes you don’t need to say a whole lot to describe a brand, a benefit, or a way of living. This ad is a perfect example. Fireman's Fund was the first insurance company to go-to-market with coverages for L.E.E.D.- certified building owners plus owners who want to convert their buildings green after a loss. The Knowledge Learning Center had a lot to offer, but had never before published a company brochure. I organized the content into easy compartments—so the reader could choose to skim the highlights or dive deep into the text, without becoming overwhelmed. Again, visuals and white space help the copy “pop” off the page. “Your Top Associate is Suing Your Practice” -- ouch. Say what you will, that’s a headline that will grab your attention if you are a veterinarian and flipping through the pages of Veterinary Business magazine. Remember the dot.com craze? 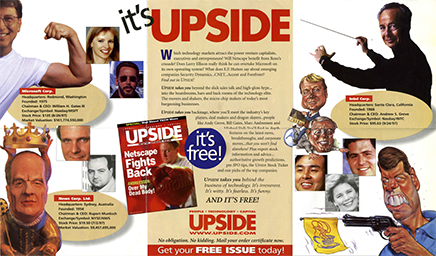 Well Upside magazine was once the Hollywood Reporter of the Silicon Valley—where readers would flock to the pages to learn about the “movers, the shakers, the micro-chip makers” living and working in the Peninsula. Included in the Fireman’s Fund “suite” of sustainable products was “Green Upgrade Coverage:” If your business burned down, you could have it rebuilt using sustainable materials and Energy Star equipment… and even get it L.E.E.D. certified by the United States Green Building Council. Not all insurance agents have marketing departments. That’s okay, Fireman’s Fund does, and often partners with agents to create “co-branded” materials and events. Here’s a little educational guide Fireman's Fund sends to agents to explain the marketing process and showcase their capabilities.